We say this is the traditional drink of old Italians. That isn’t the case everywhere. We just see old Italian guys drinking these simple cocktails while tossing a bocce ball into a sandy pit. A great summer sipping beverage intended to be enjoyed while with friends, or enemies. The Bocce Ball cocktail is a citrus juice based highball. What makes this drink unique is the amaretto and soda. This drink is kind of like a Screwdriver but much tastier. 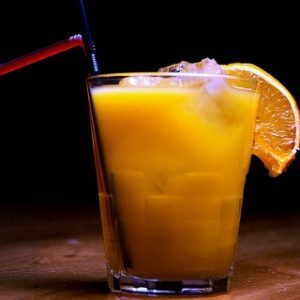 Vodka and orange juice is an old standard, usually reserved for curing a hangover. Adding the spritz of soda water, and the touch of almond that comes with the addition of amaretto make this cocktail absolute magic. Every bartender should know how to make a Bocce ball cocktail off the top of their head. Its an easy drink to remember, and compliments any cocktail list. This could also make for a very inexpensive happy hour cocktail as well, if orange juice isn’t too expensive. Pour the vodka, amaretto and orange juice into a glass filled with ice. Garnish with an orange slice and enjoy.